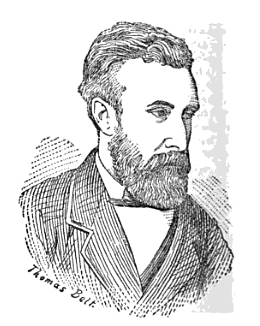 Thomas Belt, though his life was rather short, was a well-known figure among the naturalists of his time. His early gold mining activities and geological investigations (and subsequent publications thereon) established him as an expert on mining operations by his early thirties. Subsequent travels impressed upon him the importance of the action of glaciers, and he soon became a vocal advocate of the notion that continental glaciation might have caused the extinction of various forms of Pleistocene animal life, including early man. In his greatest work, The Naturalist in Nicaragua, he reported evidence for glacial epochs having occurred in that country. This study, a leading masterpiece of natural history narrative, also contains innovative views on climatological phenomena and many observations on the habits and characteristics of tropical animal life--for example, on their devices of protective coloration. --born in Newcastle upon Tyne, England, in 1832. --dies at Kansas City, on 21 September 1878. --Oxford Dictionary of National Biography, Vol. 5 (2004). --Natural History Transactions of Northumberland, Durham, and Newcastle-on-Tyne, Vol. 7 (1880): 235-240. --The Monthly Chronicle of North-Country Lore and Legend, Vol. 2 (1888): 262-263. --Journal of Science, Ser. 3, Vol. 1 (1879): 143-144.